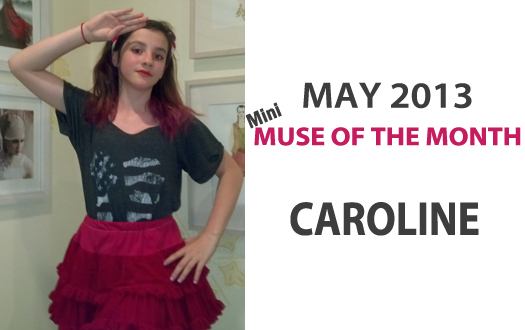 Introducing our May ‘13 Mini-Muse of the Month, Caroline! I am so excited to introduce you all to our Mini-Muse of the Month! I actually scouted Caroline at DJ Blue Steel's cousins Bar Mitzvah. This is not a joke! It was funny when I saw her we were like that is my mini-me. I went up to her on the dance floor during a snowball(lol) and told her who I was and asked her if she would be interested in modeling and walking in my upcoming NYFW fashion show and gave her my card and let's say the rest is history ;) Thankfully she knew my brand and was super excited and her amazing mother didn't think I was a crazy person lol! Caroline did in fact model for my new Girls line(see here) and walked in this past NYFW(see here) and she rocked both. Learn more about Caroline below. Thank you Caroline! There are so many important and worthy charities to support and for this month in honor of Boy Meets Girl® fight against bullying, for those who lost their lives or were so horribly injured on Patriot's Day at the Boston Marathon by the worst bullies, I am wearing this powerful Boy Meets Girl® American flag top. This top symbolizes love for each other and our country. I’m wearing this shirt to support all the troops, police, firefighters and others who keep us safe and protect our nation.